On Peace Boat voyages there are various optional tours that you can enjoy. Of course there are tours to visit World Heritage sites as well as tours to have exchanges with local people. There are a wide variety of choices so that you can choose what you are interested in to customize your journey. 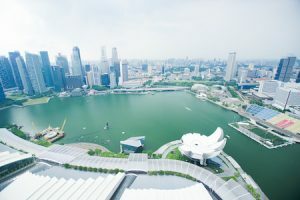 In Singapore we participated in the “Singapore Sightseeing at 3 Popular Spots” tour. 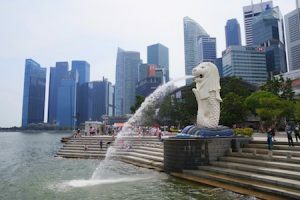 First off, to one of Singapore’s most famous spots, Merlion Park! It was so refreshing to feel the mist from the fountain in the heat of midday. Following the elegant arch of the Merlion fountain leads our eyes to our next stop, Marina Bay Sands. From the hotel lobby we got on the elevator and rode up to the 56th floor. On this high speed elevator, in less than one minute we reached the Sky Park which is over 200 meters off the ground. After getting off the elevator it seemed like we were in a different world.The stunning view gives you the feeling that you have flown into the sky and are viewing the city from above. The night time view of the illuminated city must be even more impressive! 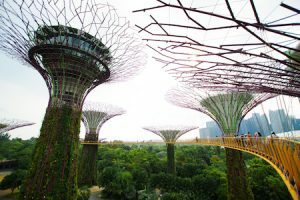 Our next stop was the vast futuristic gardens, Gardens by the Bay. Many people are overwhelmed by how impressive the tropical rainforest-inspired giant Supertree is, but if you look closely you can see all of the delicate details. Roughly a five minute walk from the Supertree is the Flower Dome. 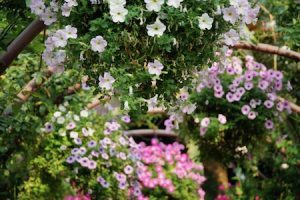 There are beautiful flowers of every color from all over the world, baobab trees and more to be enjoyed! 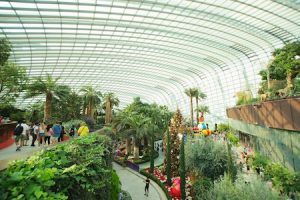 Next to the Flower Dome is another dome shaped garden called the Cloud Forest. The first thing you see upon entering is a giant waterfall. 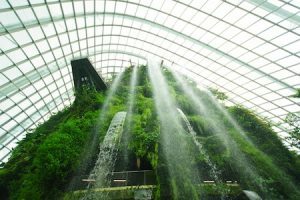 The low temperature and high humidity of the tropical highlands is recreated inside with the cool air contrasting the humid Singaporean weather out in the city. 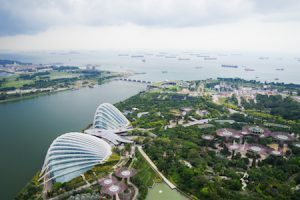 We were able to visit the Merlion, Marina Bay Sands, and Gardens by the Bay all in one day! 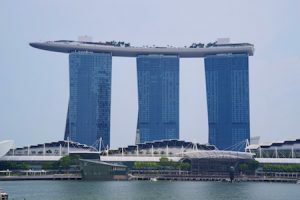 These are three must see spots when visiting Singapore. There were some passengers who had already visited Singapore three times but said that today was the most enjoyable of all of their visits. It felt like we experienced three days worth of travel in one day, it was a lavish experience. After departing from Singapore, the Ocean Dream will now head towards Port Louis in Mauritius. There are so many events to enjoy on board until the next port. The journey is going to get even more exciting from here!